When I use an ampersand (&) in a Category name with spaces in a certain order I get an error that does not allow me to submit the change. Using EE v.2.9.2. 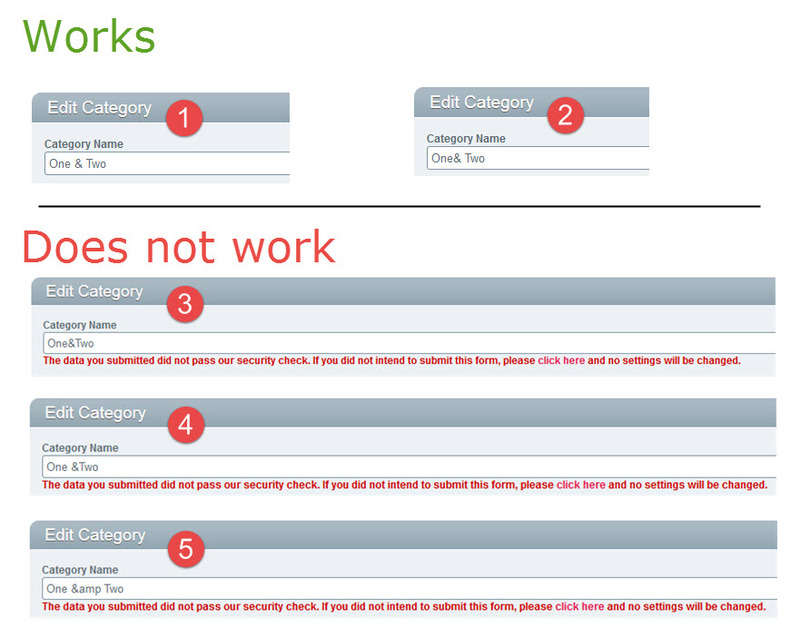 Error: "The data you submitted did not pass our security check." This seems to be the "invalid_xss_check" error. I have tried to change the Category group to "Allow all HTML" and to also encode all HTML but I get the same results. Here is what works and what doesn't work (screenshot below). Note the semi-colon after the HTML entity - you missed that on your version. Not the answer you're looking for? Browse other questions tagged categories or ask your own question. How can I pass the category ID of the current entry into the exp:calendar:cal tag?